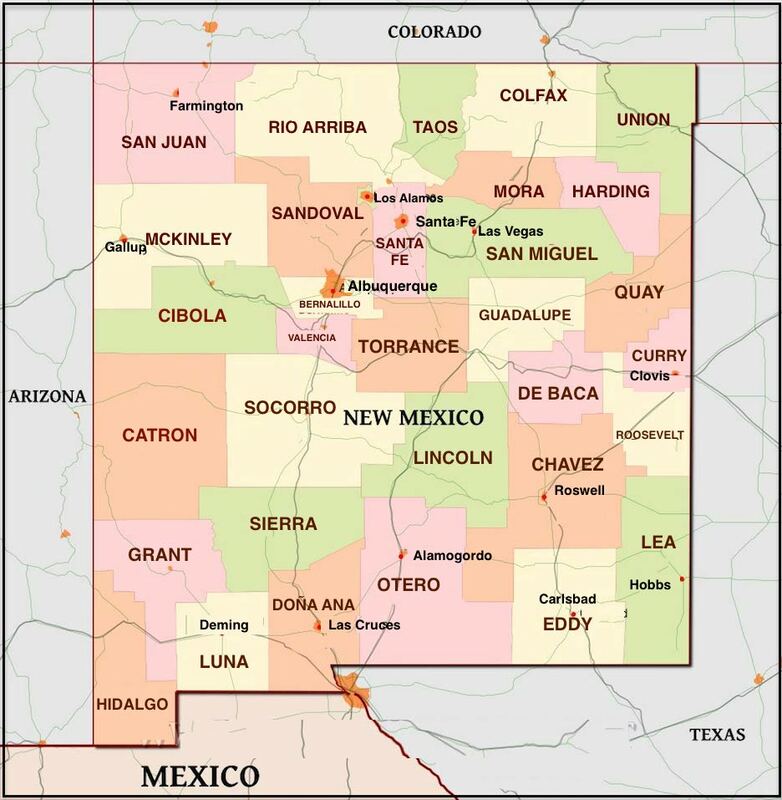 Scroll down for a free printable Map Of New Mexico counties, and also a New Mexico road map. 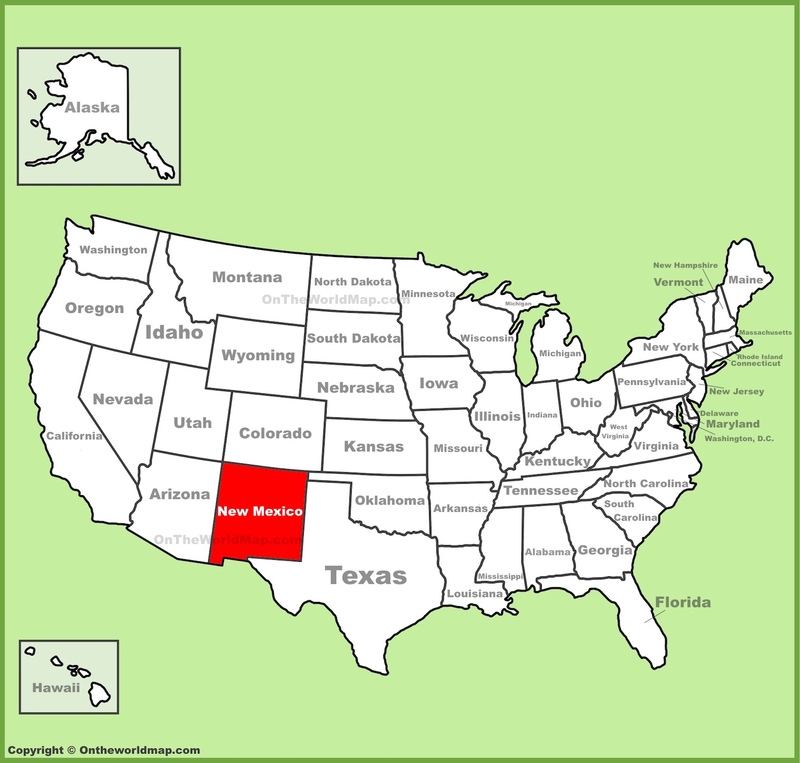 The above US map shows the location of the state of New Mexico in relation to other US states. On January 6th of 1912, New Mexico became the 47th of 50 states admitted to the Union. Scroll down to find fascinating facts about the state of New Mexico. New Mexico is nicknamed "The Land Of Enchantment" because of its drop-dead gorgeous landscapes. Taos Pueblo in New Mexico has been continuously inhabited for more than a thousand years. Located at 7,000 feet above sea level, Santa Fe, New Mexico has the highest altitude of any US state capital. Santa Fe was founded 10 years before the Pilgrims landed at Plymouth Rock. New Mexico has a higher percentage of PhDs than any other US state. The first atomic bomb was detonated in New Mexico on July 16th of 1945. There is still a law in the state of New Mexico that prohibits "idiots" from voting. Now if only we could prohibit them from running for office. Another New Mexico state law says it is illegal to dance while wearing a sombrero. Roughly 75% of the roads in New Mexico are unpaved. Albuquerque is home to the world's largest hot air balloon festival - The Annual International Balloon Fiesta. Above: A basic road Map Of New Mexico. Above: A Map Of New Mexico counties, with major cities and surrounding states included.